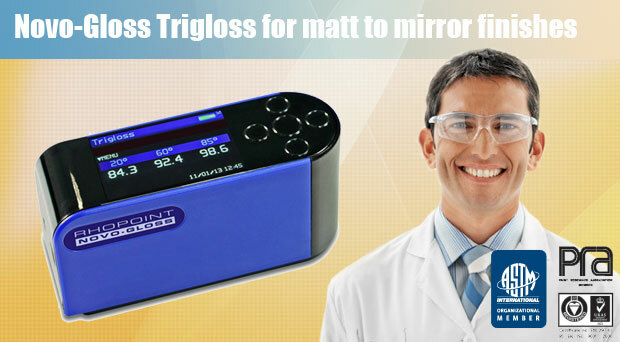 The Novo Gloss Trigloss 20° / 60°/ 85° is without a doubt the world's best value 20-60-85 degree quality angle glossmeter. This purchase guarantees you a quality gloss meter at a great price compared to purchasing either two seperate meters or a triple angle gloss meter. 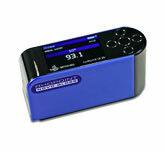 A beautiful ergonomic unit with super clear LCD display. We are the U.S. and Canadian Authorized distributor for glossmeters, haze, color and other physical testing equipment. We only supply our customers with quality reputable equipment ensuring it will not be returned to us. For a select time we are offering the Novo Gloss Trigloss 20° / 60°/ 85° Glossmeter at the lowest available price in the Americas. "Offer expires when this message is removed from this website." Replacement AC Charger for NG 20 60 85 Glossmeter: Part no. GM-14406 Price $134. Replacement Case for NG 20 60 85 Glossmeter: Part no. GM-14408 Price $85. High Gloss 93GU Gloss: Replacement Calibration Tile. Part no. GM-14301 Price $403.99. Med. 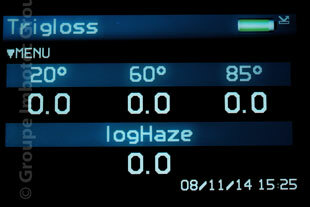 Gloss 50GU Gloss: Optional Calibration Tile Part no. GM-14302 Price $949.99. Low Gloss 10GU Gloss: Optional Calibration Tile Part no. GM-14303 Price $949.99. Mirror Gloss 1800GU: Optional Calibration Tile Part no. GM-14304 Price $403.99. High Gloss 93GU Gloss: Optional ISO 17025 Gloss Cal. Tile Part no. GM-14401 Price $403.99. Medium Gloss 50GU Gloss: Opt. ISO 17025 Gloss Cal. Tile Part no. GM-14402 Price $949.99. Low Gloss 10GU Gloss: Opt. ISO 17025 Gloss Cal. Tile Part no. GM-14403 Price $949.99. Purchase the ISO 17025 93GU Calibration Tile with Glossmeter at the same time. Note: The included Standard tile that ships with the unit is ISO 9001 and not ISO 17025. High Gloss 93GU Gloss: ISO 17025 Gloss Cal. Tile Swap Part no. GM-14501 Price $884.99. Every Quality Laboratory should have a Gloss Meter, make it a Novo Gloss. Why wait? Best Price - Best Warranty - Best Quality of Measurement.